Escalating the Palestinian leadership’s rhetorical assault on Israel, the chief Palestinian Authority negotiator, Saeb Erekat, on Monday claimed that 96 percent of Gazans killed in the summer’s Israel-Hamas conflict were civilians, reiterated PA President Mahmoud Abbas’s charge of Israeli “genocide,” and accused Israel of seeking to impose apartheid on the Palestinians. Not even the most extreme anti-Israel Gaza NGO claimed that 96% of those killed in Gaza were civilians, or that 12,000 were killed. I cannot remember a single interview of his or article he’s written that was not filled with lies. So how can Erekat continue to lie so openly and brazenly in literally every statement he ever makes in public? What is behind it? This saying is Erekat’s credo! No one has the guts to tell him that he is a liar to his face and list all his lies, chapter and verse. And it is a very long list. 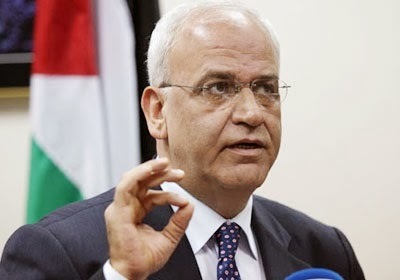 Erekat knows that once he puts his lies out there, no one will counter him – after all, he is a “moderate” and a “peacemaker,” and reporters aren’t conditioned to believe that a soft-spoken man in a suit who is considered a “moderate” will lie right to their faces. There is literally no negative repercussion to Erekat’s constant lies. So…why shouldn’t he continue them? Does anyone still get their news from the networks?